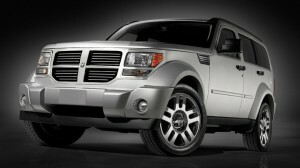 The Dodge Nitro is a mid size SUV looking to bring some class to the class. The exterior depends on a distinctive box design that really gives it a one of a kind look. The most apparent is the cross-hair grille with horizontal inserts. Other features on the outside body include fender flares and chrome and brushed silver accents. There’s also the heated door mirrors, a rails only roof rack, and body side moldings. If you’re the kind of person likes to put their own twist on a car, then the Nitro has the options to really do just that. Some of the accessories that Mopar has includes tubular side steps in chrome with a skid resistant surface. The fascia accent also comes in chrome as well and adds some great flair to the front of the vehicle. This same standard to quality goes right into the interior. Starting with the seating, which can seat up to 5 passengers, which is available in either cloth or leather trimmed. It’s an emphasis on comfort, even having four different lean angles for that passenger who just needs to take a quick nap on the trip to Atlantic City. One of the best reviewed features inside of the Nitro is the multimedia system. The Uconnect system gives access to Sirius Satellite Radio and over 130 channels of news, sports, and music. The Uconnect medic center allows you to store thousands of songs and playlists to keep your ride from getting boring by providing hours of entertainment. The Nitro includes standard six speaker sound system to really help the music ring and has an upgrade for Infinity’s premium sound system with eight speakers and an eight inch sub-woofer. The Nitro offers a great deal on the engines, with 2 available choices. The first one is the 4.0 liter V6 powerhouse. With a five speed automatic transmission and 260 horsepower, it certainly is a beast. It also includes an electronic rang select shifter to give better balance between the fuel efficiency, torque management, and shift responsiveness. The next engine you could go home with in your Nitro is the 3.7 V6. The V6 has a four speed automatic transmission and a horsepower of 210. It features advanced electronic throttle control that gives more precision driving and efficiency. The Dodge Nitro has been altered to allow for better performance when driving to take your kids to school in Long Island or taking them out to Hudson Valley for a brief vacation. It features the choice between a standard two wheel drive or a part time four wheel drive system. Both have the electronic stability control that helps the vehicle keep control when a spin happens. This goes along with the anti-lock brakes to make sure that braking happenings even during a severe New York snow storm. This is all part of Dodge’s safety measures. They want to avoid accidents from even happening. Don’t worry though, if something bad should occur, the Dodge Nitro has what it takes to protect you. It all starts with the Nitro’s frame work. It has energy absorbing crush zones that reduce the risk of injury from impact. The seats have active head restraints to help. The Nitro’s airbags are located in front for the front passenger and the driver. There are supplemental side-curtain airbags to provide even more protection for every passenger. This entry was posted in Bayside Queens, New Car, Used Car and tagged Atlantic City, Bayside Queens, Dodge, Dodge Nitro, Hudson Valley, Long Island, MOPAR, New Car, Safety, Sirius, Used Car by baysideadmin. Bookmark the permalink.